Product #5949 | SKU DDSPROND5100-B | 0.0 (no ratings yet) Thanks for your rating! Delkin's Snug-It Pro skin provides complete digital camera security in any photography atmosphere. Its tackless and powder-infused silicone mold is ideal for heavy-duty use. Whether hiking, fishing or just enjoying a calm afternoon outdoors, you can feel secure that your DSLR is fully-protected in any bag. Creating a thick rugged shell around the camera with ridges incorporated for the skin, this accessory offers a smooth texture and secure grip on your device. Unlike similar silicone-based casings, the Snug-It Pro also detracts from lint and further debris. Optimal-grade shields prevent your LCD display from scratches and other damage. Protective molding on the hot shoe and around the lens provides maximum coverage, while also taking into account quick lens changes. With a glove-like fit, this accessory maintains unobstructed access to all XTi buttons, sensors, attachments and compartments, leaving it ready to use. The Snug-It Pro reciprocates the cameras original graphic and text visuals, allowing you to take quality images in any location. 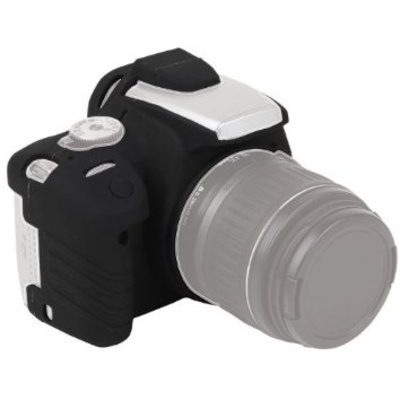 This device is also available for the following models: Canon rebel XTi, Canon rebel T2i, Canon 50D, Canon EOS 40D, Canon Rebel XSi and T1i, Canon 5D, Canon 7D, Nikon D300S, Nikon D5000, Nikon D90, and Nikon D40/ D40X/ D60.